Bill Bramhall, President of Exceptional Painting, Inc., started in the painting industry in high school, working his summer vacations to earn extra money. After high school, he worked with local painting contractors and learned all aspects of the trade from new construction to large condominiums repaints. In the years that followed, he worked his way up to become a foreman, supervising small and large crews. He learned how to estimate/bid jobs, order materials, time management and communicate with homeowners and suppliers. After several years in his position, Bill studied for and acquired his license and he, along with his partner, Rich Simmons, opened Exceptional Painting, Inc. for business. 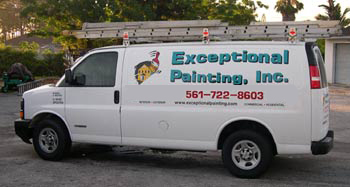 Rich Simmons, Vice President of Exceptional Painting, Inc., had been working the industry for over 10 years. In 1987 Rich and Bill met while working for the same contractor and started a relationship painting small jobs in their off hours and weekends. Rich Simmons of Exceptional Painting, Inc. started out working as a carpenter out of high school. In1985 he moved to palm beach county where he went into the painting business. Rich has painted and supervised numerous projects and developments through out South florida for over the past 20 years. In 1998, they both felt that they could offer customers a better way to paint their homes and feel confident in the decision to hire them to protect their largest investments. Our commitment to customer service is our number one priority. We strive to keep our customers satisfied throughout the entire process and offer personal service to assist in every aspect of the work, from explaining the services to be provided to assisting with color selection. Our motto "We Paint Every Home Like Our Own" summarizes our attention to detail that makes our work stand out above all others and our integrity sets us apart from all other painting companies. Website Created, Maintained, & Hosted by RPB Advisors, Inc.